Hi there. 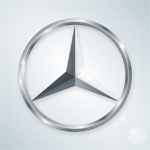 In this new tutorial I will show you how to create the Mercedes logo. It’s a pretty simple tutorial. 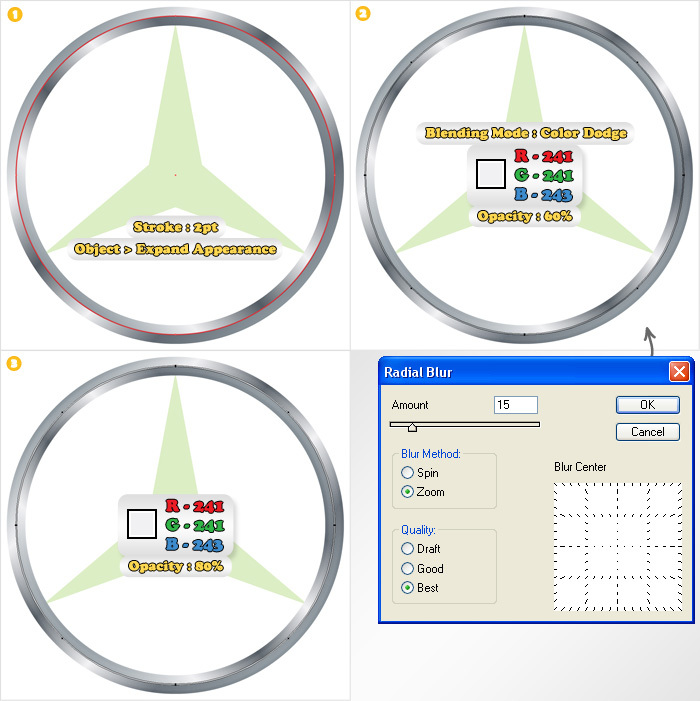 Using the Grid, the Ellipse Tool and the Star Tool you will create the basic shapes. Later, with some linear/radial gradients, strokes, gaussian/radial blur and Drop Shadow you will get the final logo. Create a 700 by 700px document. First, turn on the Grid (View > Grid) and the Snap to Grid (View > Snap to Grid). Next, you’ll need a grid every 10px. 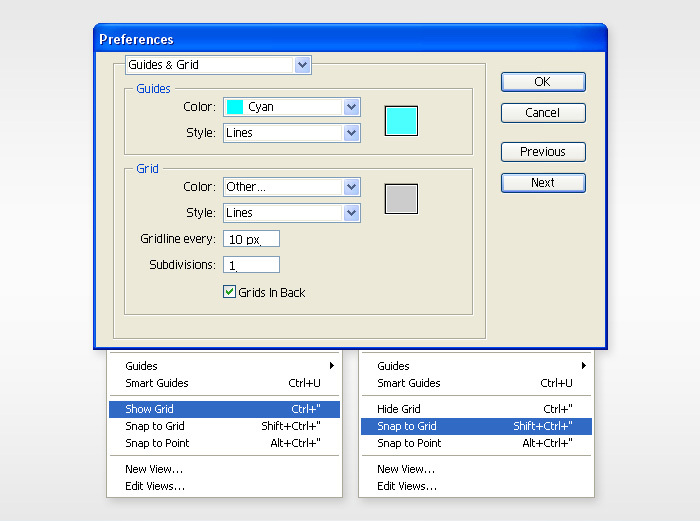 Go to Edit > Preferences > Guides & Grid, enter “10” in the “Gridline every :” box and “1” in the “Subdivisions” box. You can also open the Info palette for a live preview with the size of your shape. Al these options will significantly increase your work speed. Select the Ellipse Tool(L), hold Shift, create a 600x600px shape and name it “01”. Fill it with none and add a 30pt, aligned to center stroke. Select the Star Tool, click&drag on your Artboard and don’t release the mouse button. Press the Down Arrow to subtract sides of your star then hold Ctrl to control the Inner Radius. Most certainly, your shape will not look exactly like mine. You will have to select each anchor point (with the Direct Selection Tool) and move it separately. This might take some time. Take a closer at the grid to understand the exact position for each anchor point. The Snap to Grid will significantly ease your work. Now let’s focus on the circle. Select shape “01” and hit Control + C once then hit Control + F twice. This will add two new copies of “01”. Go the the Layers panel, select the bottom copy and go to Object > Expand then select the top copy and remove the stroke. Reselect both shapes and click on the Divide button from the Pathfinder panel. You will get a group of three new shapes. Again, go to the Layers panel, delete the inner circle then ungroup the other two shapes (Shift + Control + G). Fill the remaining two shapes with the linear gradients shown below. Select the original “01” shape and Bring it to Front (Shift + Ctrl + ]). Lower the stroke size to 2pt then go to Object > Expand Appearance. Fill the resulting shape with R=241 G=241 B=243. Change its blending mode to Color Dodge, lower its opacity to 60% then add the Radial Blur effect (Effect > Blur > Radial Blur). Create a copy of this shape. Change it’s blending mode back to Normal, erase the Radial Blur then raise the opacity to 80%. 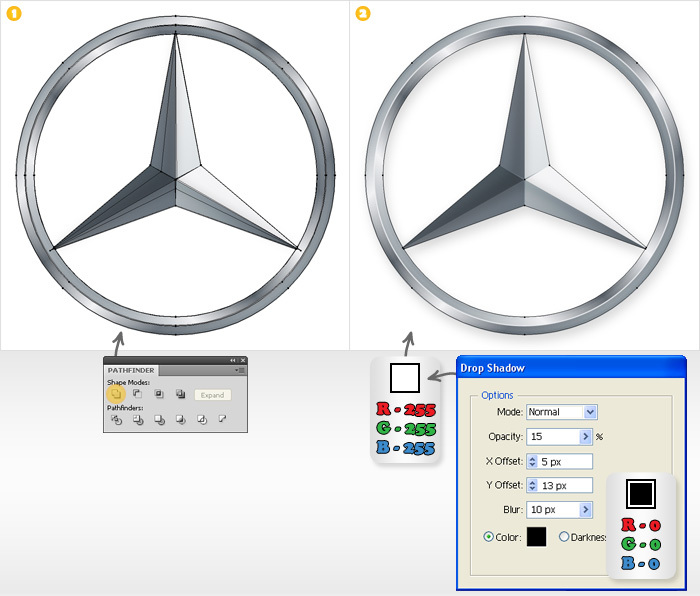 Select all the shapes created so far (except the star shape) and group them. Name this group “Ring” and Bring it to Front (Shift + Ctrl + ]). Disable the Snap to Gird (Shift + Ctrl + “) and enable the Smart Guides (Ctrl + U). 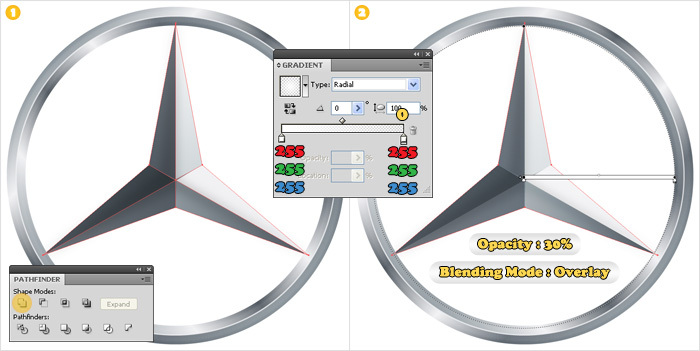 Select the Pen Tool(P) and create three paths to achieve the results shown in image #1. Each path starts and ends at an anchor point. With the aid of Smart Guides, you’ll be able to easily locate the starting and ending anchor points. 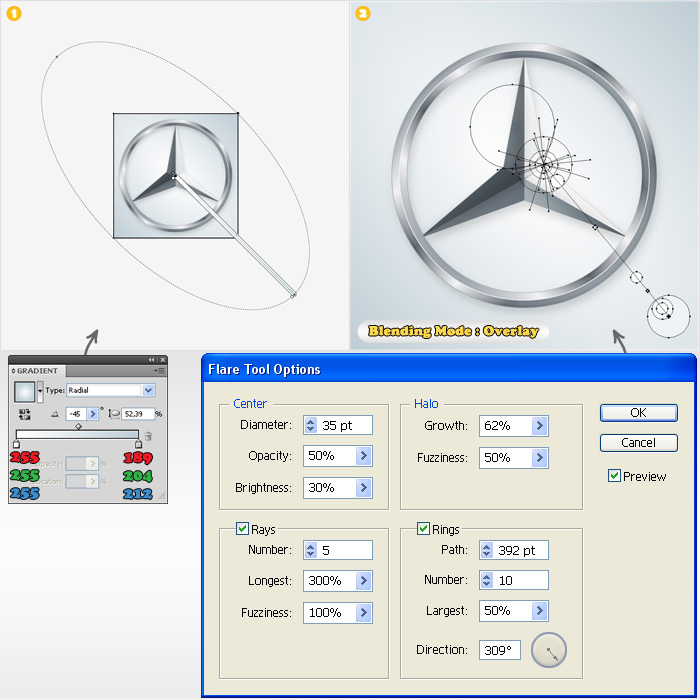 Select these paths along with the Star shape and click on the Divide button from the Pathfinder panel. This will divide the star into six shapes. Fill them with the color and the gradients shown below. Keep the Smart Guides enabled. 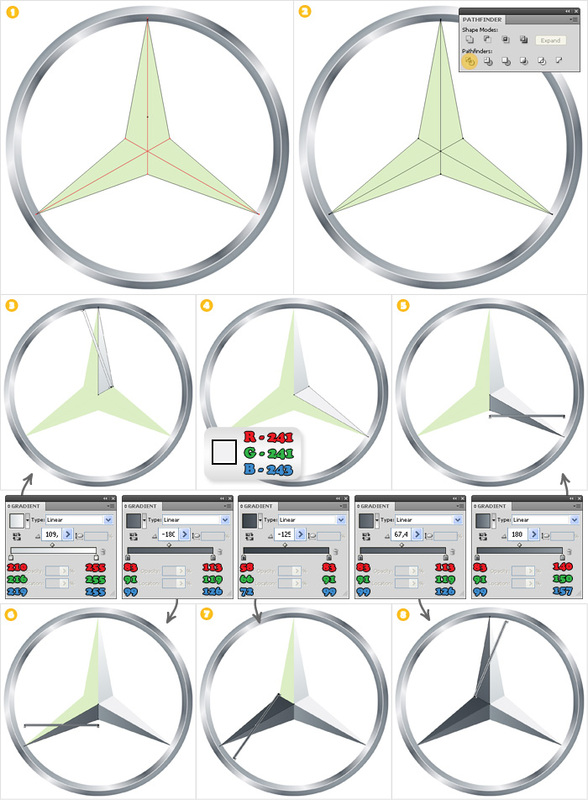 Reselect the Pen Tool(P) and create the two paths shown in the first images. Fill them with none and add a 5pt aligned to center stroke. Select both paths and go to Object > Expand Appearance. 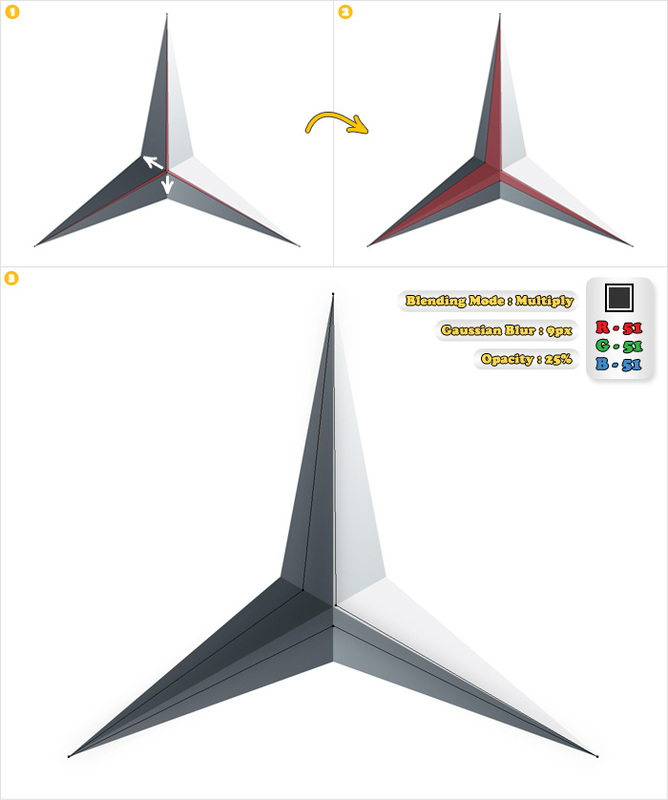 Select the resulting shapes and click on the Unite button from the Pathfinder panel. 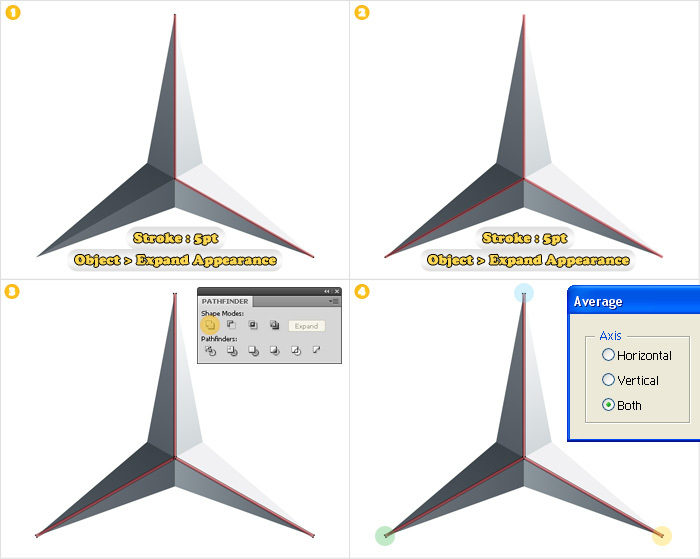 Pick the Direct Selection Tool(A), select the anchor points highlighted with green(image #4) and go to Object > Path > Average. Check Both and click OK. Repeat the same technique for the anchor points highlighted with blue and yellow. Now, the shape made in the previous step should look like in image #1. Pick again the Direct Selection Tool(A) select the anchor points and move them in the direction pointed by the white arrows. Fill it with R=51 G=51 B=51, change its blending mode to Multiply, lower its opacity to 25% then add a 9px Gaussian Blur effect (Effect > Blur > Gaussian Blur). Reselect the Pen Tool(P). This time, let’s focus on the center of the star. Create the two paths shown in the first images. Again, fill them with none and add a 2pt aligned to center stroke. Expand these strokes and unite them. 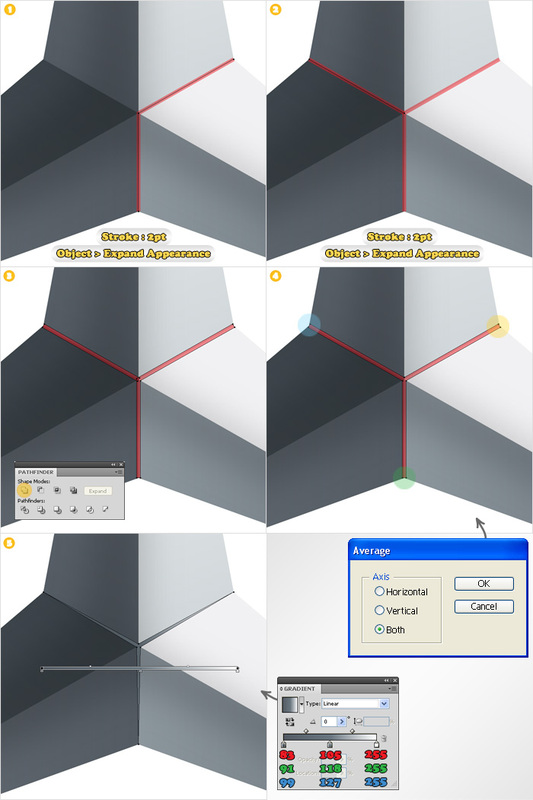 Now, use the Average option for the anchor points highlighted in image #4. Finally, fill the resulting shape with the linear gradient. Duplicate the star components. Select these copies and click on the Unite button from the Pathfinder panel. Fill the resulting shape with the radial gradient, change its blending mode to Overlay then lower its opacity to 30%. 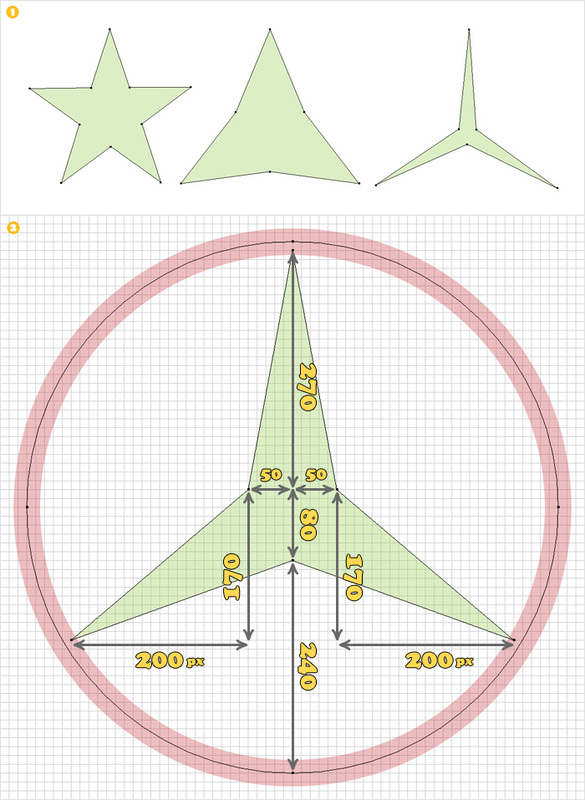 Move this shape above the star shapes (in the Layers panel). Duplicate all the shapes created so far. Select all these copies and click on the Unite button from the Pathfinder panel. Select the resulting shape, fill it with none and add a 1pt, aligned to outside stroke. Select this stroke and go to Object > Expand Appearance. Fill this new shape with the radial gradient. Once again, duplicate all the shapes created so far. 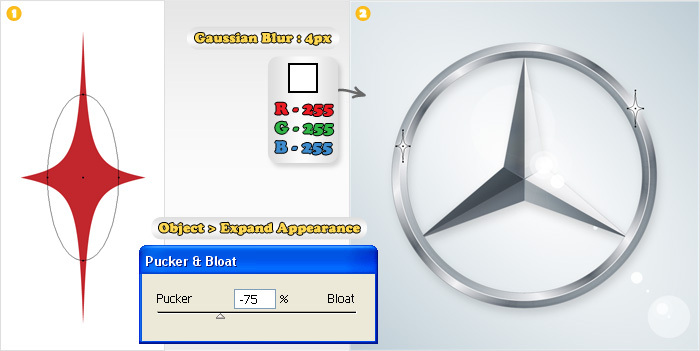 Select these copies and click on the Unite button from the Appearance panel. Select the resulting shape, Send it to Back (Shift + Ctrl + [), fill it with any color(i used white) then add the discrete Drop Shadow effect (Effect > Stylize > Drop Shadow). For the background select the Rectangle Tool(M). 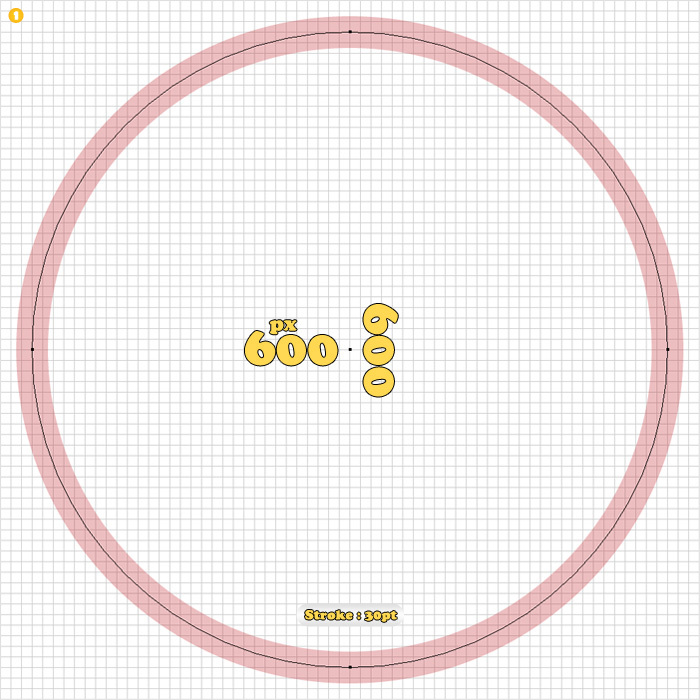 Create a 700x700px shape and fill it with the radial gradient. Next, select the Flare Tool, add the flare effect then change its blending mode to Overlay. 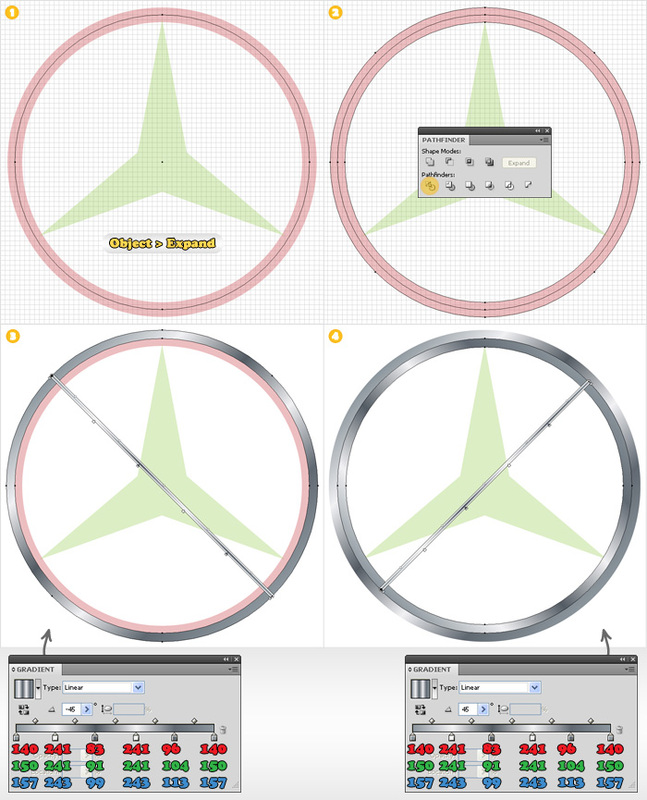 Finally, select the Ellipse Tool(L) and create a shape like the one shown in image #1. Fill it with any color, add the Pucker&Bloat effect then go to Object > Expand Appearance. Select the resulting shape, fill it with white, add a 4px Gaussian Blur effect then duplicate it. Place these two shapes as shown in the final image. Hi, thanks for the tutorial…I get some new technique. 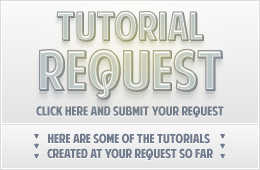 I like those tutorials your resource is very good. Thanks for your posting. In Step 06 we need right color code. All color = 255.255.255 this is waight. You’re right. I made the correction. Let me know if you spot other errors. Till now i think that’s all. Please upload new image for step 6. I did. Take another look. But when I press the Unitebutton in step 12 the new shape consists of hundreds of anchorpoints. I don’t know what I did wrong…? The number of anchor points is not that important as long as your shape looks like in the image. The shape is not exactly the same because there are also a lot of anchorpoints on the middle circle of the ring and in the middle of the star. 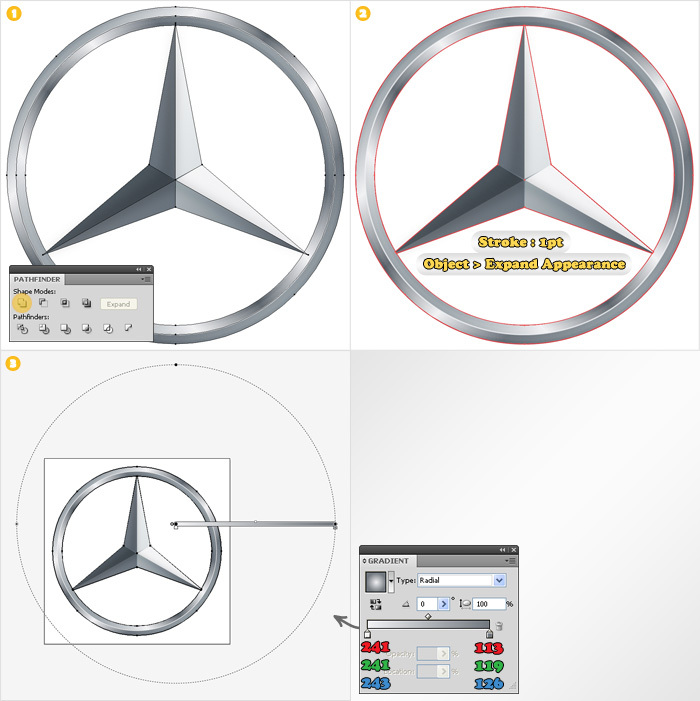 Its really easy to create Mercedes logo with the help of this tutorial. This is a very nice tutorial. Thank you for the great techniques. In step 4 when you begin working on the circle Im confused about what to do to get the rings to separate. I made two copies of “01” and tried to follow your instruction but when I go to Object> expand appearance…. expand appearance is grayed out and only “expand” is available. I tried expand but I dont see a change. and the pathfinder tool doesnt seem to make three different shapes. Id like to complete this tutorial so please respond if you have any idea on what could fix this. It’s my fault, I just made the corrections. The correct command is Object > Expand. You can also use Object > Path > Outline Stroke. I made some changes in the text and now it’s easier to understand. Try it again and let me know if you got it. Thank you very much for your help…………I got confuse in step 4. I followed Object > Path > Outline Stroke. Thanks a lot. It is a great tutorial. Jan, Could please specific and explain why it is so bad? That’s not true in my humble opinion. Great how the photoshop tools are still basically the same but better UI. Thank you for the tutorial. Very much helpful. Thanks for the share very useful article.